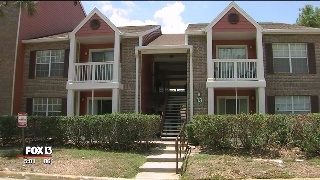 ST. PETERSBURG - Several tenants at a St. Petersburg condominium complex are waiting to hear if they can get back into the homes after they were evacuated Sunday. Deputy Fire Marshal Lt. Steven Lawrence, with St. Petersburg Fire Rescue, said at least 10 people in two buildings were forced out of their homes at Vantage Point Condominiums due to termite and water damage. "As far as the fire department is concerned, right now it's unsafe for the occupants," Lawrence said. "The stairwells themselves are compromised. The concrete is cracking as well as pulling away from the walls themselves." Rotting wood is visible on two separate buildings. Cracks in the concrete of the breezeway went all the way up to the third level of the buildings. The residents who haven't been evacuated fear they might be next. Karl Schmitz, an attorney for Vantage Point's community association, said the complex has been in the process of renovating every building for the last six months and the news came as a shock. "To the best of our knowledge, none of these buildings are structurally unsound at all," Schmitz said. "The residents' safety is the biggest concern, followed of course by their inconvenience." The tenants who were evacuated are being put up in a hotel by the complex, according to the fire department. to inspect the same buildings. Lawrence said the complex can decide to allow tenants to return, but a community representative would have to sign a waiver acknowledging the risks and accepting the responsibility should something happen.